Beautifully engraved SCARCE Third Liberty Loan $100 4 1/4% Bearer Gold Bond of 1928 from the United States Government issued in 1918. This historic document was printed by the U.S. Treasury and has an ornate border around it with a vignette of Andrew Jackson. All four coupons attached. Red "THIRD LIBERTY LOAN". Red treasury seal. This item has facsimile signatures of Teehee and McAdoo and is over 95 years old. Folded in thirds with two tiny pin holes from original mailing and remittance card. Crisp EF condition. 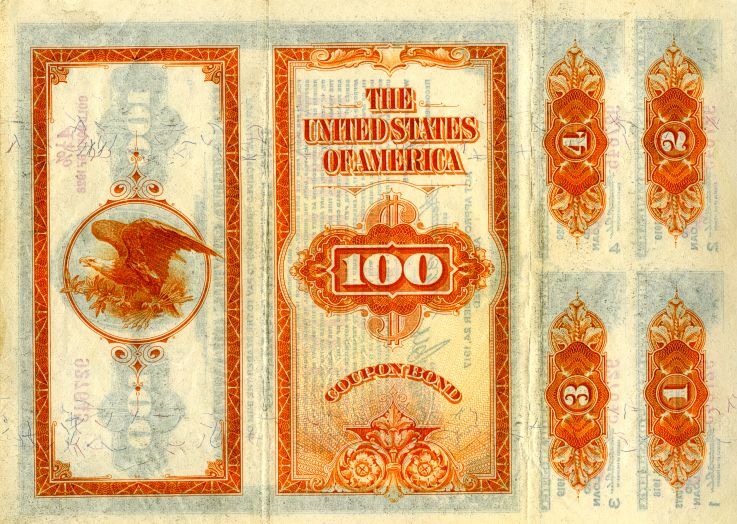 Approved under the Act of April 24, 1917 this Liberty Loan bond was authorized to raise funds to help win the first World War.